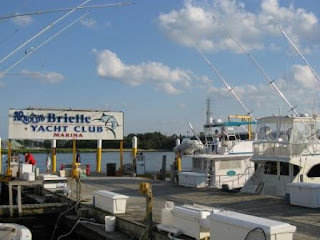 We ended up spending three days in Brielle which turned out to be a nice place. Dock master, Mike, a retired cop, took pity on us and gave us a good rate. Joe got to visit with him, the other dock workers and dock visitors and contractors and boat owners. Cap'n Terry arrived the same day we did in a Jerret Bay sport fisher. It had only taken him 5 hours to get there from Ocean City, MD. He was not so concerned about the weather, because of his speed, but was having trouble with his electronics - no fun in thick fog. He was delivering the boat farther north and trying to be back in Ocean City for an upcoming fishing tournament. Every morning he would pull out, only to return again because of some new mechanical problem. Rocky and I got to take some walks on "the hard." He's always enjoyed a good walk, but does so even more now that they're at a premium. We found that many people in this little town take living in the Garden State seriously. This is a photo of part of a garden at a small restaurant - the restaurant wasn't that great, but the garden was beautiful. Strolling around town, many houses were nestled under mature trees with similar gardens. Interesting note: After we posted the picture of the lighthouse in Delaware Bay we got an email from Harry Trimble - an old friend that lives in Berlin, MD. He said that his grandfather used to work at that lighthouse and he even has a picture of him fishing from it! The next morning, after Joe had contacted some Park Police friends, we were given permission to bring our dinghy to the USPP Marine Division dock on the back side of Ellis Island. We visited with the officers on duty for a while and then went in to see the museum at Ellis Island. Neither of us had been there before (it opened in the 1990's) and found it to be quite interesting. There were lots of pictures of people who came through, and quotes from some of them, and also recorded memories from some. One that I really like was from an Italian immigrant who said he'd come to America and found out that not only were the streets not paved in gold, they weren't paved at all, and he was expected to pave them! Sunday morning we moved the boat over to a floating dock at the nearby public boat ramp to meet our friend Tim Foster. For several days Tim had been trying to figure out the logistics of getting on board and riding up the East River and into Long Island Sound with us. The timing of hitting the tides correctly is critical and thunderstorms were predicted in the early afternoon. As we sat on the boat with Tim, debating whether we should even leave and whether he was to accompany us - there was a thunderous crack of lightning out of nowhere, but very near by. We all looked at each other and said, "We're not going anywhere!" Tim left and we decided to stay tied to the dock for the time being. As predicted, a violent storm came up. As Joe tended our lines through the storm, he also helped those in small boats and jet skis get their boats onto trailers. Why they hadn't come in earlier was beyond us, but there was a steady stream of them throughout the storm. The next day the weather was more cooperative and we crossed New York Harbor and went up the East River. We were just in awe of the views of the buildings along the way. I took way too many pictures - if you're into buildings, they'll be posted on the picasa site(http://picasaweb.google.com/joseph.pica ). This summer there is an art project in NYC with a series of four waterfalls. This picture shows one of them. Where the East River meets the Long Island Sound is called Hell Gate. We timed our passage through there as our waterway guide had suggested and hit it right, but you could see by the disruptions on the surface of the water that it could be tricky. Things went well and we made it to an anchorage near Norwalk, CT. The next day we started off planning a fairly long day with the intention of reaching Mystic, CT. After a few hours one of the engines started acting up - black smoke, no rpm's and everything! A quick change of plan brought us to Branford, CT and a nice marina - with repair people and small fish that stick their fins up out of the water. This is the best picture I could get of the fins. Under the water, there were fish everywhere! The repairman diagnosed a bad lift pump and ordered one overnighted, and installed it the next day. Prior to the repairman's return, Joe sheepishly discovered a small roll of tape he had left on the engine had partially blocked the air intake to the engine. He removed it and the engine ran fine. the repairman discounted any cause other than the lift pump Joe wisely didn't argue ... so a new one was installed under warranty. As we continued east in Long Island Sound we were impressed by the size of it - and also the amount of debris that floated by. This seemed to be a large tree. We also saw what appeared to be a telephone pole. The radio was filled with reports of large pieces floating in different areas. We anchored that night in East Bay off Fisher Island which is an exclusive private Island close to CT but actually part of NY. We could see a very interesting golf course laid out over the rocky shore line. Joe fretted over an oncoming thunderstorm that thankfully passed us by.